Special Invitation for Leaders in Afterschool! Welcome, Afterschool Leader! 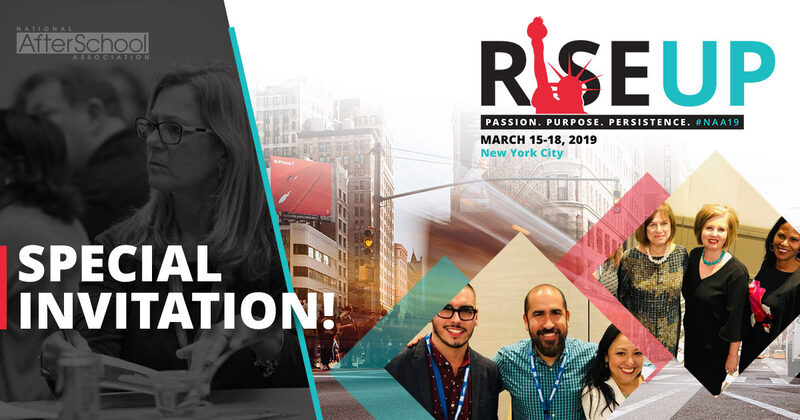 The 2019 NAA Annual Convention (NAA19) coming to New York City, March 15-18, includes targeted opportunities designed for leaders to connect, share and learn. This year, we’re hosting a slate of “invite only” leadership events that include special opportunities - opportunities to network with other key leaders, special guests and to lend your valuable voice in support of afterschool and afterschool professionals. Please review the leadership session schedule below. Interact with authors of the new volume, Social Emotional Learning: Foundations and Futures, while examining the foundations of social emotional learning in child and youth development community programs. The session will illustrate current cutting-edge practices in systems as well as programs, grapple with measurement, and discuss the challenges and opportunities of positioning afterschool and summer opportunities as not only contributors but leaders in this rapidly growing field. Share your experiences and ideas as we create a call to action to fund and sustain professional development for afterschool staff and leaders. Join us for a special evening as we recognize NAA’s Next Generation of Afterschool Leaders 2019 honorees and honor Ellen Gannett of the National Institute on Out-of-School Time for her decades of leadership in the field of afterschool. When registering for NAA19, use the invitation code NAA19InviteOnly. Using this code will secure your space for the “invite only” sessions and ensure that you receive further details. If you've already registered, please contact us at Convention@naaweb.org to have the invitation code added to your registration.